Hello all! It has been a while!! How y’all doing? The last few months has been full a lot of boring, non-crafty, non-home improvement stuff. Stuff has been done, such as repainting the downstairs bathroom hallway so it was no longer pink, but not much of it. That job did get rid of all the pink in the house though!! Well, except the basement floor, but that doesn’t count because it is unfinished. (Yes, the painted the basement FLOOR pink as well…) Other than that, I have been doing a lot of gardening in the front of the house and a lot of work outside of the house. Once I finish the large garden project I am working on now, I promise to get pictures up here!! 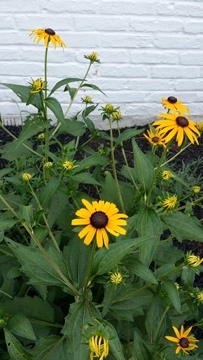 To tide you over, here is a pic of the first blooms on my Black-eyed Susans, the official state flower of Maryland. The reason for this update (finally) is to tell y’all about and document my newest project. I mentioned a while back that I wanted to make my front room into a Victorian sitting room. I started on some things, such as changing the lighting to fit the theme and getting artwork, but I held back on the actual designing of the room until I had the most important part of the room – the fainting couch. I have always wanted a fainting couch and when I first walked into the house back before it was mine, I knew exactly where one should live. The problem is that I could not work on transforming the room until I knew what my color scheme was going to be and that all depended on the color of the couch. My front room is awesome, but not being used for much right now. The wall with the door into the kitchen has built-in bookshelves. The entire wall. I LOVE built-ins, and was one of the big reasons I wanted this house. The bookshelves go about 3/4 down the wall and the bottom 1/4 is closed storage. Just awesome. The bottom part of the other walls have a nice thick baseboard and a nice thick chair rail with a 21.5″ space between them. There is one window on the front wall too. All of this needs to be updated to be awesomely Victorian. I truly think the pinnacle of home decor happened in this era. Because… well look at it!! So anyway, I have a fainting couch now!!! I have been looking for one literally for years, ever since I moved to MD. The ones I found were either too modern looking or too pricey. But that changed last week when I went to Curiozity Shoppe in Timonium, MD. 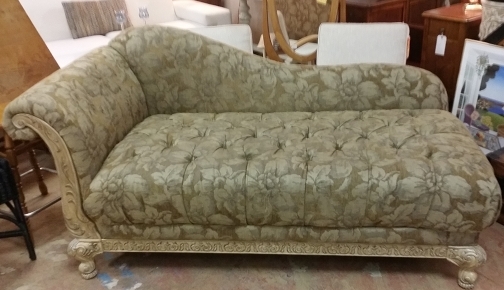 They posted this gorgeous fainting couch to Craigslist and I went to investigate. The shop owner, Donna, was a gem and wonderful to work with. She reserved the couch for me until I could pick it up and even stayed open late so me and my burly manly moving helper could get there after work last night. If the service was good, the prices were excellent. I picked this baby up for $200!! The closest couch to this one I came across in my searching was over $500. The condition is absolutely wonderful. The only thing wrong with it is that the fabric on one of the covered buttons came off. Big whoop. I can fix that with some scrap fabric in about five minutes. The wainscoting should be easy. For those who don’t know, wainscoting is wood paneling found on the bottom of walls and looks like this most times. I am going to do faux wainscoting using bead board between the existing baseboard and chair rail. It should be as simple as measuring the space, going to my handy dandy home improvement store and asking them to cut the paneling down to size, and gluing it to the wall with Liquid Nails. The most difficult part of this process will be cutting the paneling to make holes for the heating system return and outlet (which are thankfully hidden behind the couch). Hopefully I don’t mess it up. I won’t even have to paint it, as the product I am eyeing is pre-painted white. We shall see how this goes. I may work on it this weekend, not sure. Although it may be outdated now, the Victorians were all about wallpaper. Elaborate wallpaper in gorgeous designs. I want to replicate it, so I must figure out this strange beast. Since it is a small room and I only need to wallpaper 3/4 of the wall, I hope that it will not be too pricey. Since my preferred handy dandy home improvement store does not carry wallpaper anymore, I had to resort to using teh int3rw3bz and was overwhelmed with choices of damask and damask-like wallpapers. 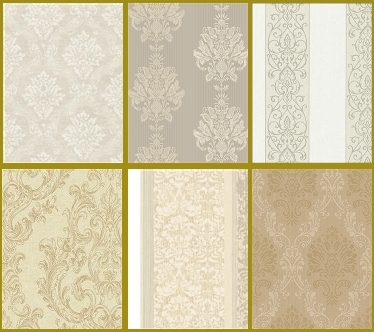 Since wallpaper samples are not free, I ordered just a handful of my favorites, which are winging their way to me now. I love damask, so that is what I am going with. Just need to find the one that works best with my lovely new couch. 1.21 gigawatts… of wallpaper! Great Scott!! Knowing I was getting this couch and what colors it was, I started trolling Craigslist for suitable side tables. I wanted to stick with light or white wood because of the base of the couch. I ended up picking up an Ikea side table for $10. The shape and size are suitable and I like the little under-table storage in the middle. The table is metal, though it does not look like it. I want to refinish it to have the same look as the couch base, possibly with a delicate design in a slightly darker color on the tabletop. If I am half as successful with this as I was when I refinished my fireplace, I will be a very happy duck. I also already have a nice Victorian style lamp for the table that I got ages ago on eBay. 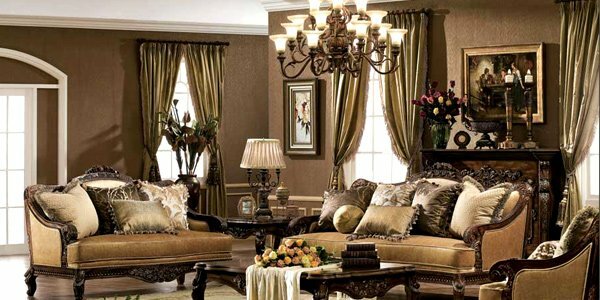 I purchased cream-on-cream floor length damask curtains for $10 at the big box store I love to hate. They come with a valence and they look good. But Victorian window treatments were extremely intricate, and I need to follow suit. So I am on the hunt for some golden fabric that will be suitable for valences. I have a roll of netting fabric and a roll of sheer fabric that can be used for the first layer, followed by the existing damask ones and some elaborate valences on top of that, which will probably have to wait until I found the right wallpaper. The last piece of the puzzle is the ceiling. Victorian ceilings were usually just as grand looking as the rest of the room, with tin tiles and crown molding and all sorts of things. I am unsure as of right now what I am going to do with the ceiling. I already painted and installed a ceiling medallion, which was a must for the style. I am not sure what I will do with the rest of the blank slate though. Right now, (like every other room) it is painted the same color as the walls, which is a middling blue color. Not a bad color, just not going to go well with my design. 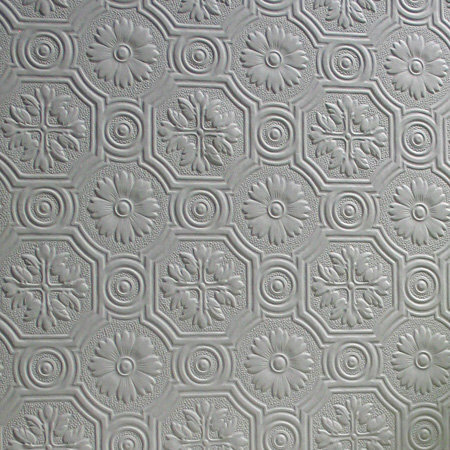 I am thinking of also wallpapering the ceiling with a paintable wallpaper like this and painting it an off-white color. I am also thinking of installing crown molding, but it all depends on pricing. We’ll start from the bottom up and see where it goes. Hopefully I will have time to do this all! I am setting myself a timeline to the end of October to get this done. And I promise to post more as I get stuff accomplished!